This scale is modern both in construction and appearance. It is designed to withstand hard usage, yet will continue to perform with accuracy. Experienced scale mechanics have incorporated sound mechanical principles to make this a smoothly operating precision instrument. The U-type chassis makes a central scope, and all parts are hung concentrically from this frame. All working parts are built around this chassis. Bronze bearings, springs made of alloys that make good precision, and scientifically heat-treated, precision ground pinions; these are some of the features that make this scale a precise one. At the same time, construction is rugged. Special construction makes the case tamper-proof. KILO SCALES are available. CAPACITY	20 Pounds - 2 Revolutions 10 Pounds on face	DIAL	10 pound × 1 oz.- 8" diameter	DESIGN	Meets requirements of the Bureau of Weights and Measures. 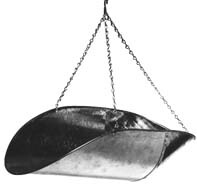 The scoop and chain are rust-proof; the scoop is strongly constructed of galvanized steel measuring 18" × 12" × 5". Complete with head.